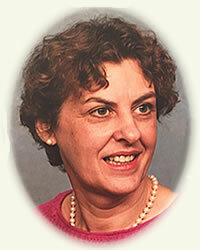 Obituary for Adele (Bialy) McGrath | Rhoney Funeral Home, Inc.
Adele (Bialy) McGrath, passed away at home, on Saturday, September 8, 2018. Her parents were Benedict and Tecla (Dlugoz) Bialy. She was proud of her father’s 41 years of decorated service to the Niagara Falls Police Department and proud of her Polish heritage. Adele attended Holy Rosary School, was a 1955 graduate of St. Mary’s High School, and attended the University at Buffalo. At UB, she received credentials as a Histology Technician. Before marriage, she worked in the Pathology Departments at St. Mary’s Hospital in Niagara Falls and St. Mary’s Hospital in San Diego. She also acted as an instructor in Lab Techniques at both hospitals. Adele married George in 1964 at Holy Rosary Church. They celebrated their 54th anniversary on August 8, 2018. They have resided in Lewiston for 45 years on Aberdeen Road. Adele was blessed with three great sons: Matt (Valerie), Bernie, Tim (Kathy) Adele was the loving and beloved Nana of Matty, Maria, Katie, Bernie, Mia, Ryan, Lauren, Colin, and Jack. She is survived by many nieces and nephews. She was predeceased by her brother, Ben, and sisters, Clare and Eleanor (Fred) Bull. In her younger years, Adele enjoyed roller and ice skating, horseback riding, skiing, bowling, and traveling. She enjoyed most, the time spent with family and friends. Adele was a devout Catholic with a full prayer life. Before her declining health, she was a daily Communicant at Fatima Shrine. We will remember her for her wonderful sense of humor and her great gift for puns. She kept us laughing even through her pain. The family will be present at RHONEY FUNERAL HOME, 901 Cayuga Street, LEWISTON, NY on Thursday, September 13, 2018 from 2:00-4:00 and 6:00-8:00. We will celebrate Adele’s life with a Mass of Christian Burial, officiated by Monsignor David LiPluma at St. Peter’s Church, 620 Center Street, Lewiston at 11:00 AM on Friday, September 14, 2018. Flowers are gratefully declined. Memorials in Adele’s name can be made to Our Lady of Fatima Shrine, 1023 Swann Road, Youngstown, NY 14174.